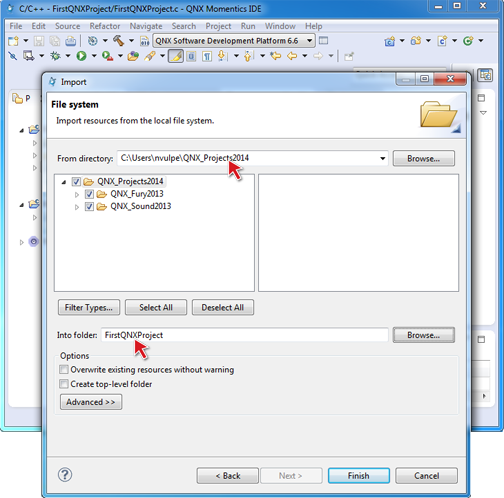 In this tutorial, you'll use the IDE's Import wizard, which lets you import existing projects and files (including files from ZIP archives) into your workspace. Note: You can use various methods to import source into the IDE. For details, see "Importing projects". Select File > Import… to open the Import wizard. 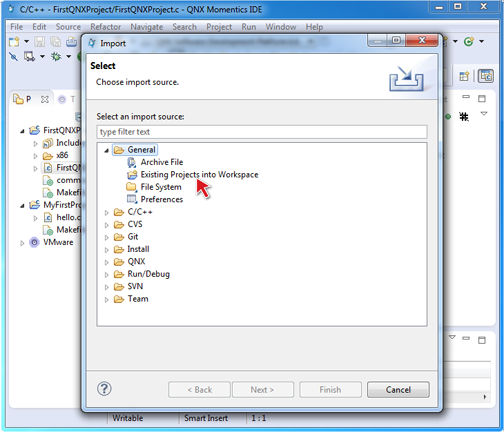 In the Import wizard, select General > Existing Projects into Workspace. The IDE shows the Import Project From Filesystem panel. Enter the full path to an existing project directory in the Select root directory field, or click Browse… to select a project directory using the file selector. This location refers to the Root directory in the File System to start scanning for projects to import. For archived files, in the Select archive file field, type in the full path or click Browse to select the path on the file system. This archive file refers to the location to scan for projects to import. In the Projects list, select the projects that you want to import from the location you specified. Select All — Select all of the projects that were found for import. Deselect All — Deselect all projects in the list. Click Finish to import the selected project into your workspace. Congratulations! You've just imported one of your existing projects into the IDE.